The best way to determine whether or not you have a low vitamin D level is to have your vitamin D blood levels measured. Of course, the most natural, intended and effective way of increasing your Vitamin D is through exposure of the human skin to the sun's UVB rays, but as this is not always possible, supplementation is a consideration. The blood test you require to diagnose if you have a low vitamin D level is called a 25-hydroxy-vitamin D test, 25(OH)D test or 25 OH vitamin D test. There is another test that tends to confuse many people and is actually the wrong test - called a 1,25-dihydroxy-vitamin D test. 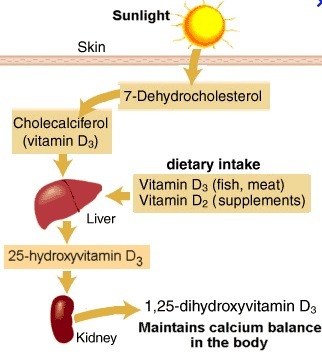 In fact a common cause of high 1,25-dihydroxy-vitamin D is a low vitamin D level or vitamin D deficiency. ie. low 25(OH)D.
So when doctors see the 1,25-dihydroxy-vitamin D is normal or high and tell their patients that they are OK, they are most often vitamin D deficient! Another option is the Vitamin D Council's Home Test. This enables a blood spot test that you can order online without going through a doctor. You can see how this is done in the video below. What defines a Low Vitamin D Level? 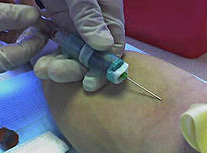 When you get your blood test results you will see the number in units of ng/ml, for example, 50 ng/ml. These are the units that health professionals in the United States use. Elsewhere in the world, vitamin D blood test results are given in units of nmol/l. This is severely deficient by every standard out there, including the Institute of Medicine, the Endocrine Society and the Vitamin D Council. By Endocrine Society and Vitamin D Council standards, you’re still deficient in vitamin D, but mildly deficient according to The Institute of Medicine. With vitamin D levels in this range you’re more likely to develop osteoporosis and your bones may be affected because your body isn’t absorbing enough calcium. This means you’re more likely to fracture or break bones and more likely to have a fall. You may also have high levels of parathyroid hormone in your body - which controls the levels of calcium and phosphorus in your body - and too much can affect your bones. Vitamin D Council and The Endocrine Society say this is deficient in vitamin D. However, the Institute of Medicine say you’re getting enough vitamin D.
In this range you’re less likely to have health problems than when vitamin D is at lower levels. However, your body may still be producing too much parathyroid hormone and not fully absorbing calcium, which can affect your bones. Research shows that levels above 30 ng/ml may be more likely to prevent bone problems such as fractures. Vitamin D Council say you’re still not quite sufficient in vitamin D, though your levels are better than most people’s. Endocrine Society and Institute of Medicine say you’re getting enough vitamin D.
Bottom line, your body will absorb calcium well and you should have the right levels of parathyroid hormone, which means strong and healthy bones. Some research studies have shown reduction in the risk of developing cancer plus improvement in immune systems. 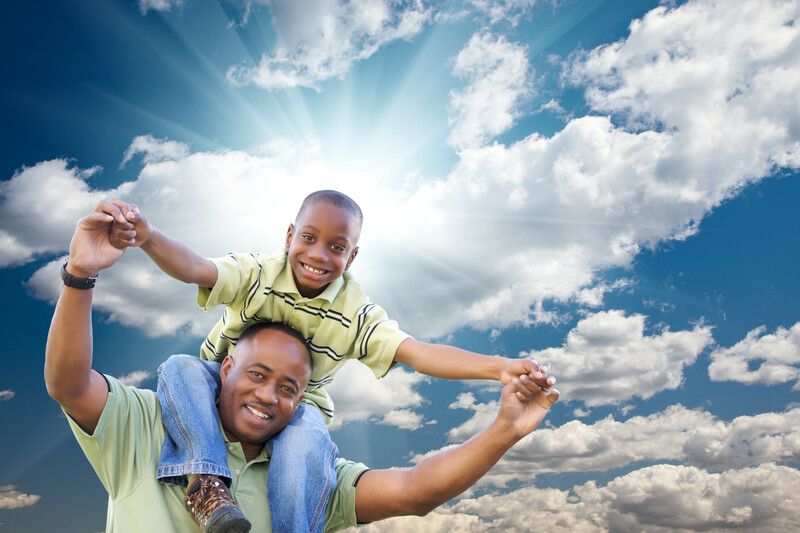 You are getting enough vitamin D - by the Vitamin D Council, Endocrine Society and Institute of Medicine's reckoning. The level of parathyroid hormone and calcium in your body are well controlled. Breast milk will contain vitamin d to pass on to your baby. A reduced risk of some cancers, improved heart health and circulation, plus a strong immune system to fight infections have been shown in research projects. All organisations' standards agree this is the right amount of vitamin D. However, the Institute of Medicine, doesn’t believe a level higher than this is of any benefit. Same as above but the Vitamin D Council considers this a “high-normal” level that can be obtained just by exposing your skin to the sun. Thus they believe these to be healthy and natural levels. Research is ongoing to establish if there is any benefit to having vitamin D levels this high, but equally, there is no known danger. These levels are believed to be achievable only through supplementation but there are no known benefits to being this high. Not considered toxic at this level they are however, thought to be too high. Also, there are no known benefits over 100 ng/ml. You have toxic levels of vitamin D, which can be harmful to your health. You should take steps to lower your levels to below 100 ng/ml unless you’re under the supervision of your doctor. If you do have a deficiency, it could lead to a multitude of other diseases. The best thing to do is to de-demonize the sun and reverse the brainwashing into believing that small amounts of sunshine in the middle of the day will NOT harm us but rather will provide a fabulous life enhancing property. So, embrace the sunshine whenever possible, but wear sunscreen and protective clothing after you have allowed sufficient time in the sun completely unprotected. Diet supplements can help boost your low vitamin D level, but not as efficiently as sunlight can. Studies have shown that as many as three out of four Americans suffer from low vitamin D. One specific study published in 2009 in the Archives of Internal Medicine (a leading scientific journal), found the following in their blood. Some medical practitioners have gone as far as to say it's the most common medical condition in the world, affecting over one billion people and research is piling up to show just how essential Vitamin D is to our optimum health. Of great interest as well as concern to me, is that some of these health experts are saying that this epidemic of low Vitamin D levels can be passed on to the next generation! This is due to some recent studies showing that low Vitamin D levels are capable of being imprinted on infants and then affecting them their whole lives. eg. Infants deficient at birth can remain so for several months after birth, which may put them at risk of developing many chronic diseases much later in life. So, how much vitamin D do we need? U.S. and Norwegian researchers have found that people who live in higher latitudes are more prone to low Vitamin D levels as well as being more prone to developing common cancers, heart disease, high blood pressure, Type I diabetes, multiple sclerosis, and depression.